Puppies Nip and Dogs Chew! Labradors love to chew. And chew. And chew. Be prepared! I find it helps to puppy proof the house. Labs will chew electrical cords, toxic houseplants, fine furniture, books, toys, TV remotes, homework assignments, and more. Use the crate when you can not be watching the puppy. Spray anti-chew products such as bitter apple usually work quite well for most puppies. Provide your puppy with a large assortment of safe chew toys and teach the puppy which things are his toys. I recommend hard nylon bones (Nylabones), sturdy rope bones, and hard rubber toys if your puppy is an aggressive chewer. Watch your puppy carefully with rawhide bones, latex toys, vinyl toys, and soft cloth toys. These toys are okay only when you are supervising your dog. Discard toys when they have coming apart or are small enough to get caught in your dog's throat. The puppy can rip off small pieces of these toys and swallow them. Rawhide chews are not an ideal toys and I do not recommend them. 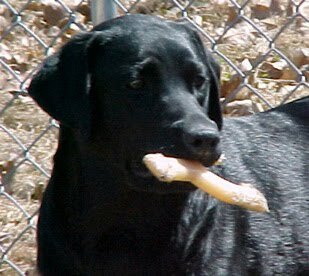 If you give your dog rawhide bones, only use rawhide from USA animals that has been processed in the USA. Dogs can chew off pieces, swallow them, and get the rawhide stuck in their stomach. The rawhide pieces swell and will not pass through the dogs intestines. Surgery may be required. If you don't catch the puppy in the act of chewing something of yours, don't scold him. Dogs associate scolding with the current action or behavior. The puppy will not understand that you are scolding him for something that he did hours ago. I recommend using a crate when you are not watching the puppy. Labs will chew almost anything if given the chance. You Are Not A Chew Toy! Puppies explore their environment with their mouths. Nipping is a normal, acceptable form of play between littermates. Some puppies begin to learn bite inhibition from their littermates. When the puppy leaves his canine family, he/she must learn behaviors that are acceptable to his/her human family. Puppies often consider children as playmates with the same status as littermates, so be prepared to help your children. Try different types of corrections until you find one that works with your puppy. Don't forget to praise your puppy when you get the desired responds. A harsh verbal response is sometimes enough. With a high-pitched harsh tone, say "OUCH" or "NO BITE". Remember to be consistent and patient. It takes time for your puppy to replace nipping behavior with a more acceptable forms of interaction. If the puppy doesn't respond to the verbal reaction, try spritz of water from a spray bottle filled with water. Try to avoid making eye contact when you spray the puppy in the month. When the nipping stops, reward your puppy with a treat or a toy. Distract and redirect. After you get his/her attention, offer the puppy a toy and then praise your puppy for taking a toy. Teach your puppy the sit command. Reward the sit with a treat, a toy, or the toss of a tennis ball. Puppies love to play with empty plastic bottles. (Remove the cap and the plastic ring from the bottle.) Toss the empty bottle for the puppy. For an interactive game, tie a rope to the bottle and move the bottle around the yard for your puppy. A variety of toys is helpful. The noise of a shake can sometimes distracts the puppy. Place a dozen pennies in an empty soda can and tape over the opening. Shake the can when the puppy starts nipping. Then give your puppy a toy to play with. Withdraw your attention. Turn away from the puppy and keep your hands out of reach. When the puppy is calm, offer him a treat or a toy. Gentle restraint is sometimes helpful. A sudden and/or tight grip must be avoid to prevent the puppy from injuring his lips or tongue. Very gently cup your hands around the puppy's mouth for a few seconds, and give the verbal command "NO BITE". Immediately reward your puppy with positive attention- praise, a treat, or a toy. Do not allow children to do this. They could easily hurt the puppy if pressure is applied. The restraint must be very gentle, and that's something many children wouldn't understand. Brief isolation will sometimes teach your puppy that you consider nipping to be antisocial behavior. Put the puppy in a brief "time out" in a crate with a favorite chew toy. Don't scold the puppy. Calmly place him/her in a crate or puppy pen. Avoid the types of play that encourage rough, competitive interaction, such as tug-of-war, wrestling, and chasing. Teach your children not to yell and run from the puppy. Your puppy will think this behavior is an invitation to play. Nipping and jumping are common responses.